I'm finding myself using the iPad more and more as a productivity tool, which is good. I've come across a number of apps recently that that really helped with this. The first is PlainText, by Hog Bay Software. This is a really simple writing application with a clean, minimalist, interface with the killer fact that it syncs to DropBox. 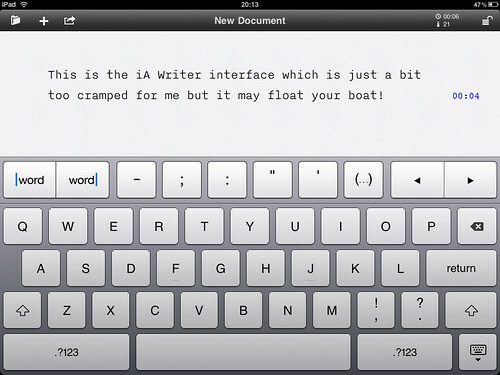 This means that the text files that I create are available on my iPad, iPhone, Mac and Work XP laptop. Indeed, it's accessible to anyone that I share the DropBox folder with. Later this month, Scrivener will also be able to sync to PlainText via DropBox, so all of a sudden I have a pervasive and portable writing solution. There are two modes to look at the screen; with a sidebar showing all the files – and folders – you have, and a ‘focus’ mode that only shows the document that you are working on. The interesting thing is that the text width doesn’t change on either. At first I was disappointed that the focus mode didn’t increase the amount of text displayed on a line, but then I realised that it approximates your field of focused view when looking at the screen. PlainText is v1.0 at the moment, and there are updates already queued at the app store to add functions and improve usability. One thing that I should mention is that although it is free as an application, it has an iAds hook which appears on iOS 4 devices. You can pay to remove this, which costs ¬£2.99 across all instances. I really like this software. An honourable mention should go to iA Writer, which in some ways is very similar. It syncs to DropBox (manually triggered) and has a similar minimalist font, albeit a typewriter style one rather than a serif face. 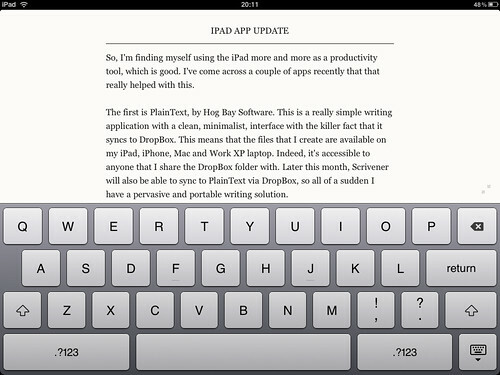 It also has some extra tools for editing which are clever. However, I just feel that it takes up too much of the screen with the keyboard and extra controls and feels constricted like you're watching your typing through a letterbox slot. 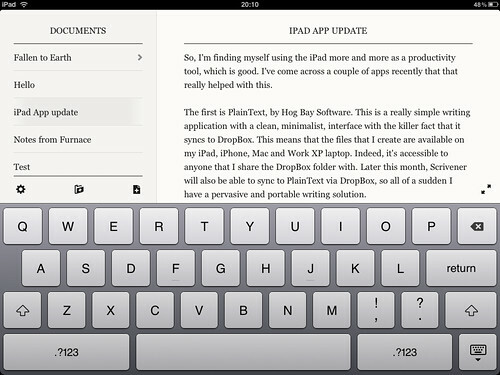 It's also iPad only, unlike PlainText. It is worth a look, but it wasn't quite the one for me. CarbonFin Outliner is something that I've been using more and more. It is an outlining package, so good for planning structure for projects, doing to do lists and also for taking notes in a lecture. 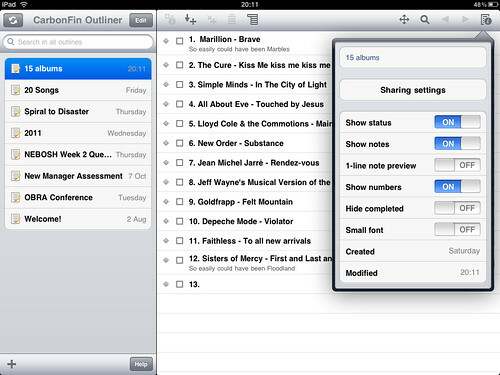 I had been waiting for OmniOutliner to make to the iPad (which is coming) but this already touches all the bases so I can't see a reason to change. It's not universal, but there is an iPhone version. 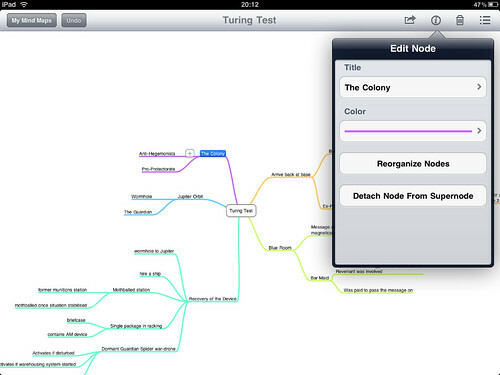 Mindnode is another application that I've recently stumbled upon. This is a universal iOS version of a program available on the Mac under OS X (both in freeware and paid versions) which is quite the best mind mapping software I've come across. It's strength is in the simple drag and drop interface and the focus. It also exports nicely in a variety of formats (including OPML which means that you could mind map and drop it into Outliner if you wanted to). I'm really impressed with this and imagine that it will get quite some use. I may try it at work as it supports mirroring vs the VGA out cable. The last app to discuss is called Touch Up and is a great little filter tool for editing photos. It's quite different to the more traditional apps like Photogene, as it applies a filter to a whole picture, then you can erase or modify the effects by touch. The header picture for this entry was created in it. 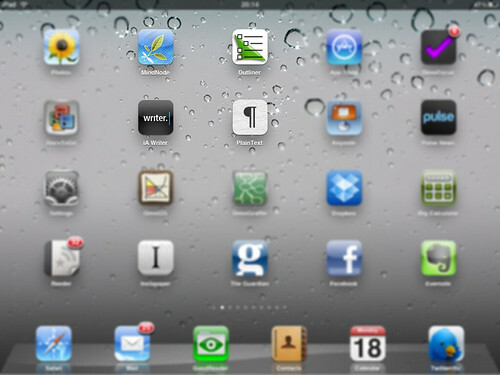 It's a screenshot of my home page with a blur filter applied and then removed over the apps I has talked about. You can stack layers one on top of another, which can lead to extra effects. There is also an in-app upgrade which adds tools like dodge and burn, which are probably even more useful for photographers. 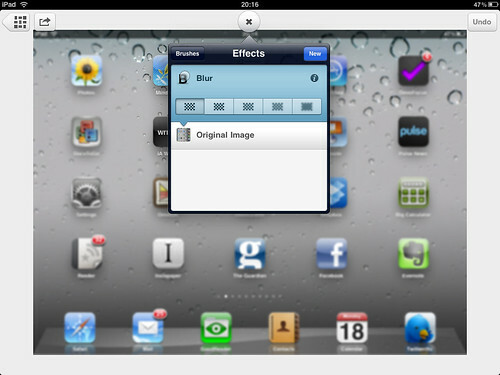 I think that there is a place for this and the more traditional apps like Photogene in the iPad users arsenal. As a final thought, if you fancy signing up for DropBox, which gives you 2Gb storage for free, then let me know, as if I invite you and you accept we both get extra storage! Win-Win!